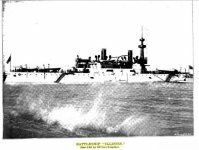 Three Indiana class battleships were authorized in November 1890 amid growing concern that several South American navies had purchased capital ships that were larger and more powerful than any in the US Navy. In part this spurt of activity reflected fear of European aggression. Secretary of the Navy Benjamin Tracy included a reference to a hypothetical attack on New York in his annual report for 1890, and the burning of Washington by the British during the War of 1812 stood as an oft-cited example of the dangers of an unguarded coast. National pride played a role, too; it was humiliating to find that little Chile had two battleships when the United States had none. During the administration of Benjamin Harrison (1889-1893) the Navy's strategy began to change from defense and commerce protection to offensive fleet action. President Harrison called for the continued and rapid construction of modern warships and the acquisition of bases to maintain the U.S. fleet in foreign seas. He later urged Congress to authorize construction of battleships, giving support to Secretary of the Navy Benjamin F. Tracy's goal of making the U.S. fleet strong enough "to be able to divert an enemy's force from our coast by threatening his own, for a war, though defensive in principle, may be conducted most effectively by being offensive in its operations." The American drive for export markets came to be linked with naval needs. Not only did our growing foreign commerce require protection, but heightened trade rivalries would increase the probability of war. So reasoned the navy's Policy Board in an 1890 report. At the moment, the report said, the nation was fairly safe. "We fear no encroachments upon our territory, nor are we tempted at present to encroach upon that of others. . . . We have no colonies, nor any apparent desire to acquire them. . . . " Most of the nation's foreign commerce was carried on in foreign ships. .. All of these reasons combine to make the United States self-contained to a greater degree than any other important nation, " and accordingly lessened the chances of conflict with other countries. "But there are not wanting indications that this comparative isolation will soon cease to exist, and that it will gradually be replaced by a condition of affairs which will bring this nation into sharp commercial competition with others in every part of the world. . . . In the adjustment of our trade with a neighbor we are certain to reach out and obstruct the interests of foreign nations." This greatly increased the danger of war. In fact, the board was so certain of future crises that it asked for funds to build over two hundred additional warships, a request which was indignantly rejected by an astonished Congress. The Indiana class battleships would have a long range cruising capability. A prejudice still existed against 'high-sided' armorclads, and these were designated as 'coast-line battleships' and given very moderate freeboard. To allay the fears of isolationist Americans they were classified as "sea-going coastal battleships". These three would join the fleet between November 1895 and July 1896 just prior to Theodore Roosevelt's appointment as Assistant Secretary of the Navy in 1897. Only six years earlier the US had no plants capable of making shafts, armor, or gun-forgings, and none of the mighty tools required in this work. American steel, American experts asserted, was superior to that made abroad. Certainly American workmanship was more finished. It is worth while to consider what a battle-ship like the Indiana really is. In the first place, their cost approximated $3,500,000, or only $250,000 less than the sum the Government, under the wise policy of Thomas Jefferson, paid for the entire Louisiana purchase, with its immense territory. This sum is almost exactly one half of what Alaska cost the govemment, and a little more than one quarter of what England paid to this country as the result of the Alabama arbitration. The wonder was, not that it costs $3,500,000 to build her, but that it did not cost five times that much. The ships had enormous coal bunkers carrying almost 1,600 tons of coal which allowed them to cross an ocean without recoaling. They were the first U.S. ships to combine this capability with heavy armor (heavier than any other American ship at the time) and heavy main gun armament. The Indiana class of three sister battleships were twenty-five percent smaller than the battle-ships being finished in England. It was claimed that they were therefore that much less of a target, and they were described by American naval experts to be superior to any engine of war yet constructed. The small displacement of the Indiana class was secured by a notable sacrifice in the speed element and a vital sacrifice in the matter of hull and battery protection, which latter would not, for one minute, be considered efficient if this class of vessels had to be taken under advisement as a type to be laid down again. An examination of the plans and specifications of the Indiana class would fully reveal their defective protection to hull, ammunition supply and the auxiliary battery and its personnel. It may be urged that if an Indiana were to be laid down again, on the same displacement, a better compromise could be secured amongst the several elements, entering battleship design, than was considered possible at the date she was originally put on the building blocks. This is only barely probable and necessary in a very limited degree, for it still takes weight to get each required element, and even with the tremendous strides that have been made towards securing more resisting armor for less thickness, and the decrease in weights of engines and boilers for same power, it would, without any shadow of doubt, be found, that the new Indiana's final combination of power elements would not be far different from what it is now, assuming that the present powerful battery was retained and given all permissible protection. This class had low freeboard which made gun operation difficult in heavy seas and the guns were not centrally mounted which resulted in elevation limitations due to submergence of one side of the ship or the other. Counter-balances were eventually added to the rear of the turrets, alleviating this problem. The excessive rolling of the ships in seas was fixed by fitting of bilge keels. The coal bunkers were positioned along the outside hull which provided additional protection to the magazines, however, their proximity to the magazines was a dangerous practice at best. Coal dust explosions could possibly set off the magazines. In spite of these limitations, all three took part in the Spanish-American War, Indiana particularly distinguishing herself in the destructions of several Spanish destroyers. By the time America entered World War One, these ships were completely obsolete and had been relegated to training or other duties. HMS Dreadnought's debut in 1906 revolutionized the design of battleships with a significantly higher speed and centerline mounted main gun armament. This class had been removed from front-line service by the end of 1906 but served auxiliary duties up until 1919. 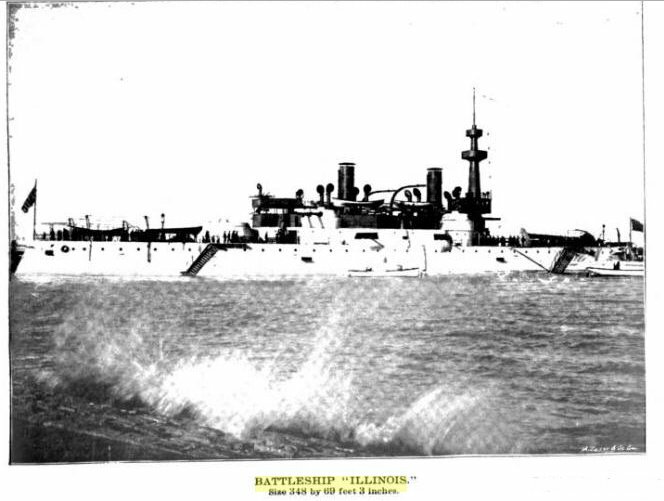 At the Chicago and World's Columbian Esposition of 1892, along the Naval Pier on Lake Michigan, floated, or rather stood, the Battleship "Illinois" - an exact reproduction of a United States coastline battle-ship. Famous as the "brick ship", its dimensions were length, 348 feet; width, amidship, 69 feet 3 inches; from water-line to top of main deck, 12 feet; from water-line to top of "military mast," 76 feet. Designer, Frank W. Grogan. Cost, $100,000. The Government naval exhibit was made in the battle-ship, the ship being manned by a crew detailed by the Government, and the discipline and life on a man-of-war shown. On the berth-deck were exhibited the various appliances that make up a man-of-war outfit, including samples of clothing, provisions, and other supplies of the sailors. The vessel has a full battery of guns of the size and caliber of the actual ship. The guns were made of wood and covered in imitalion of steel. All the uniforms of American sailors were shown by janitors dressed in appropriate costumes. This imitation battle-ship of 1893 is erected on piling on the lake front in the northeast portion of Jackson Park. It is surrounded by water and had the appearance of being moored to a wharf. The structure has all the fittings that belong to the actual ship, such as guns, turrets, torpedo tubes, torpedo nets and booms, with boats, anchors, chain cables, davits, awnings, deck fittings, etc., etc., together with all appliances for working the same. Officers, seamen, mechanics and marines are detailed by the Navy Department during the Exhibition, and the discipline and mode of life on naval vessels are completely shown. The detail of men is not, however, as great as the complement of the actual ship. The crew give certain drills, especially boat, torpedo and gun drills, as in a vessel of war. The dimensions of the structure are those of the actual battle-ship, to wit: length, 348 feet, and width, midships, 69 feet 3 inches ; from water-line to the top of the main deck, 12 feet. Centrally placed on this deck is a superstructure 8 feet high, with a hammock berthing on the same 7 feet high, and above these are the bridge, chart-house and the boats. At the forward end of the superstructure there is a cone-shaped tower, called the "military mast," near the top of which are placed two circular "tops" as receptacles for sharpshooters. Rapid-firing guns are mounted in each of these tops. The height from the water-line to the summit of this military mast is 75 feet, and above is placed a flagstaff for signaling. The battery mounted comprises four 13-inch breech-loading rifle-cannon ; eight 8-inch breech-loading rifle-cannon; four 6-inch breech-loading rifle-cannon ; twenty 6-pounder rapid-firing guns ; six 1-pounder rapid-firing guns; two Gatling-guns and six torpedo tubes or torpedo guns. All of these are placed and mounted respectively as in the genuine battle-ship. The superstructure contains the cabins, staterooms, lavatories, lactrines, mess-rooms, galley and fittings, mess-table for crew, lockers, berthings, and also shows the manner in which officers and enlisted men live, according to the rules of the United States Navy. On the deck and bridge of the superstructure the manner in which the rapid-firing guns, searchlights, beats, etc., are handled, is shown. The entrance to the conning tower is from the deck of the vessel, in which are all the appliances that the captain has at his command when taking the ship into action and during the progress of a battle at sea. An electric light plant is provided and arrangements made for heating with steam. On the berth deck are the various articles usual to the hull, machinery and ordnance; ordnance implements, including electrical machines, gun-carriage, motors and range-finders; models showing typical warships of the past and present; samples of the provisions, clothing, bunting, flags, and naval stores in general-in short, all the supplies that go to make up the outfit of a man-of-war. The costumes of the sailors of the Navy from 1775 to 1848 are exhibited by janitors dressed in those suits of clothing. On the starboard side of the ship is shown the torpedo protection net, stretching the entire length of the vessel. Steam launches and cutters ride at the booms, and all the outward appearance of a real ship of war is imitated. This imitation battle-ship was designed by Frank W. Grogan, architect of the U. S. Naval Exhibit, under the direction of Capt. Meade, U. S. Navy, and Lieut. Tussiug, U.S.N. The idea of having a structure to represent a man-of-war, manned with all appliances in position is new, and was conceived by Capt. R. W. Meade. Nothing of the kind had ever been attempted before, and the cost of this curious and original structure was about $100,000.